It all started on December 11th, when the people of Fort Frances, Ontario (one of the coldest towns in Canada) discovered that their benches and fire hydrants had been yarn bombed! Two days later red yarn around the town, lead to Tim Horton’s! The whole restaurant had been “bombed” overnight! A giant knitted hat and scarf cozied up the outside of the building. 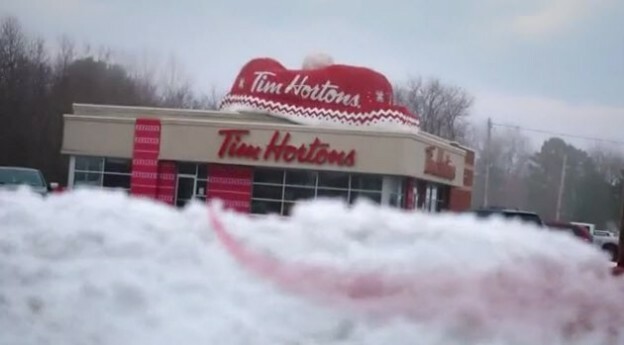 As part of an ongoing campaign to send warm wishes, Tim Hortons has donated yarn to various organizations to knit hats, scarves, mitts etc to send warm wishes to those in need. The video is just great…have a look! This entry was posted in knit-crochet-in-the-news on December 21, 2014 by Marlene P..